Other driver who worked with foreign couple at Galle Face Court ... also murdered! Apart from the Sri Lankan driver whose dead body was recovered mysteriously murdered on the fourth floor of Galle Face Court Housing Complex a few days back, the dead body of the other driver who served in the same house was found in Peliyagoda. of the DNA of the skull. As such, the Colombo Crime Division informed court that the missing skull was that of the person known as Ashoka Siriwardena. A complaint had been lodged with Kirullapona Police that Mr. Ashoka Siriwardena living in Moratuwa and a Sri Lankan driver serving under that foreign couple last December 5th had disappeared. This information came out when the post mortem was conducted yesterday (6) on one Senaka Srilal (49), a driver who was living at Hokandara, Talangama and who was found mysteriously murdered a few days before on fourth floor of Galle Face Court. In the context of the death of both these two Sri Lankan drivers the two of them had served with an investor of Sri Lanka Investment Board, a British national and his sixty year old Thai wife, Colombo Crime Division informed court. For the autopsy of this death, the said foreign couple as well as the lift operator of that flat and a labourer gave evidence in the presence of court. 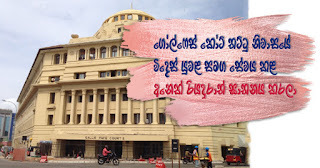 As another ift operator was not present in court yesterday (6) he was ordered by court to Colombo Crime Division to see that he is present on the next day. The foreign couple who were the petitioners in this case requested for permission to leave abroad and the court granted consent to leave abroad under strict conditions for the period next 8th to March 1st. Court imposed conditions to provide their telephone numbers and the address of the hotel in which they were staying abroad and to withhold a sum of Rs. 6.5 million in the bank account of this couple ... Colombo Crime Division. Court also informed that they should arrive in Sri Lanka in case Colombo Crime Section notified that statements are to be secured from complainants relevant to this incident. It was last 19th that Colpetty Police managed to find the person called Senaka Srilal (49) mysteriously dead. He was a resident in Hokandara, Thalangama and had served as the driver of this foreign couple. The body of this driver was recovered when he was tied to a chair in the room and a pillow was stuck on his face and it was burnt, which was the complaint made by the foreign couple concerned. The magisterial inquiry is scheduled to be held next 25th.